Click on the Image below to access the Winter 2019 NYSATA News. Can't access the Flipbook E-Reader edition? Click here for a PDF printable copy. NYSATA makes the digital News available to the public through this site. 1 edition per year is a print-only editions, available to NYSATA members only. If you like the digital news, help support NYSATA's mission to advance art education in New York State by becoming a member. If you have trouble downloading files, you may need to update your Adobe Reader. Go to http://get.adobe.com/reader/ to install or update Adobe Reader now. It's free. 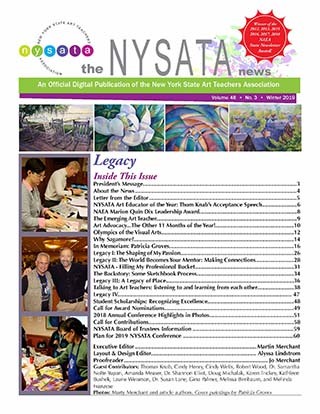 The NYSATA News is a publication that contains information vital to the field of art education in New York State. In addition to timely articles, advocacy information and current news about NYSATA initiatives is included. Three digital issues per year are published, along with one print issue (Conference Edition) that is mailed in the Fall. Digital Edition of the NYSATA News! Our students, colleagues, friends, and family all constantly inspire us. When we think about a legacy, we look back on circumstances and people that remain with us and continue to affect the way we behave and think and teach. In this issue, we do some remembering and treasuring. Pat Groves, who passed away in December, was very dear to us – and we miss her talents, her companionship, and her tremendous capacity for giving. She continues to lead us in many ways. As you read, listen to how we remember Pat and the other dedicated, generous, nurturing people that have been and continue to be our guides. Just click on the flip book to the right to view our exciting digital version of the Winter Issue of the NYSATA News! For information on submitting, please email [email protected]. For advertising questions, please email [email protected]. Powerful Imaging: the News can be viewed on your computer (best quality, requires up to date flash plug-in) as well as your ipad, kindle fire, iphone, android, and blackberry devices. Mobile devices do not have the animation feature but will allow you to scroll through the pages as with any e-reader app. Search: Readers can easily perform full text searches in a single edition or entire publication archive. The search results are highlighted in each page. Video, Audio, and Link Support: Readers can click on any blue hyperlink to connect to web pages or emails. We are just getting started! Look for video and multimedia content in future issues! Bookmark: If you think you can only put tabs on printed books, think again! With the bookmark feature, readers can add tabs to bookmark their favorite pages. Print: print any articles or pages you choose. Sticky Notes: Readers will be able to create sticky notes anywhere on a page and view them when they come back to read the News. Readers can easily edit or delete sticky notes at anytime they desire. Sharing: With the Share feature, they can either email the News they are reading to a friend, as well as post it on HUNDREDS of social networking sites! Facebook, Twitter and Tumblr anyone? Flexibility: The ability to Download to PDF from ePageView if you prefer reading in traditional format.